Trigonometry is the branch of mathematics that literally means "measurement of, with and by means of triangles". Trigonometry is most simply associated with right-angle triangles. Let’s talk about right triangles first. The two sides of a triangle forming a right angled triangle are called the legs of the triangle and the longest side of it is called the hypotenuse. The three major trigonometric ratios are sine, cosine and tangent. Basically, they are ratios of two sides of a right triangle and a related angle. Trigonometric functions are mainly used to evaluate unknown lengths or angles in a right triangle. There are mainly six functions of trigonometry ratios and all are related to each other. Trig ratios mainly serve the purpose of solving the triangles. Solving the triangles mean to find the length of all the sides and the measure of all the angles of a triangle which ultimately gives the sum of 180 degrees. In this chapter, we will discuss the use of trig ratios to find the side lengths of a triangle. This lesson will cover how to use trig ratios to find the side lengths of a triangle. Let’s throw light on the six major functions that are used to solve the triangles and can be used in place of one another. Now, that we are familiar with the six functions of the trig ratios it’s the right time to learn how to use these functions to solve the problems. 1. Choose either sin, cos, or tan by checking out which side you know and which side you need to find. 2. Replace your information into the trig ratio. 3. Solve the concluded equation to find the length of the side. 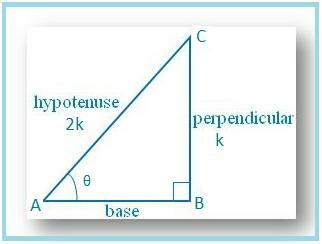 a) In a right triangle, the side opposite the right angle is called the Hypotenuse. b) CA is called the side opposite angle θ.
c) BC is called the side adjacent to angle θ.
d) AC is called the side adjacent to angle φ.
e) BC is called the side opposite angle φ. If sin θ = 1/2, show that (3cos θ - 4 cos3 θ) =0. Let us draw a ∆ ABC in which ∠B = 90° and ∠BAC = θ. Then sin θ = BC/AC = 1/2. Let BC = k and AC = 2k, where k is positive. Hence, (3cos θ - 4 cos3 θ) = 0. That was all about trigonometry ratios. The whole chapter teaches you to study the triangles and be expertise. Hotmath can assist you to have trig ratio problems and solutions in detail. This link can help you with all kinds of problems of trig ratios with explained answers. This link can teach you all the lessons coming under the trigonometry ratios.